Actuators are used to act upon an environment, usually for moving or controlling a mechanism or system. Actuators drive everything that moves on a mobile robot. 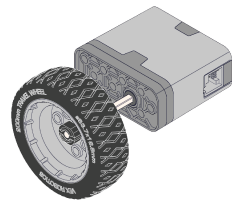 The most common type of actuator is a motor; in particular, VEX IQ utilizes Direct Current (DC) Motors. DC Motors convert electrical energy into mechanical energy through the use of electromagnetic fields and rotating wire coils. When a voltage is applied to a motor, it outputs a fixed amount of mechanical power (usually to a shaft, gear, and/or wheel), spinning at some speed with some amount of torque. Motors apply torque in response to loading. Motor Loading happens when there is any opposing force (such as friction or a heavy mass) acting as a load and requiring the motor to output torque to overcome it. The higher the load placed on a motor output, the more the motor will “fight back” with an opposing torque. However, as you learned in the Key Concepts Unit, since the motor outputs a fixed amount of power, the more torque the motor outputs, the slower its rotational speed. If you keep increasing the load on a motor it eventually stops spinning or stalls. A DC Motor draws a certain amount of electrical current (measured in amps) depending on how much load is placed on it. As the load increases on the motor, the more torque the motor outputs to overcome it and the more current the motor draws.